Charlie Carruthers is the man responsible for applying natural plasters to more EcoNests than anyone else. He is an early pioneer in the natural plaster revival and we are excited to have him teach in two EcoNest workshops this season: On Salt Spring Island Aug. 5-6 and in Ashland Oregon Oct. 7-9. There are two apprenticeship opportunities available in October. I interviewed Charlie from his home in Santa Fe New Mexico. PBL: When and how did you first become interested in natural plasters? CC: In my mid-20’s, while living in southern New Mexico I became interested in adobe architecture and building. I got a job working at an adobe yard making bricks. Soon I was laying adobes. At some point I was asked to plaster a bedroom, then the exterior of a home using the same material that the adobes were made from- a clay rich soil, sand, and straw. I don’t remember having any instruction. It was a skill that came pretty readily to me. By that time I did have a background in throwing clay pots- that probably contributed to my facility. So that was my first foray into natural plastering; really I was just following a traditional that goes back a long time in the Soutwest. 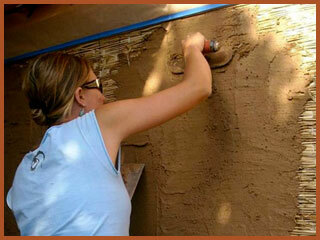 Later I moved to Santa Fe to join a crew building custom adobe homes under the tutelage of two artist/builders. When it came time to plaster, I wanted in. Cement stucco and gypsum plasters were the norm for most homes in Santa Fe, so those were the materials I worked with for some time. By the late ’90s, as the natural building movement was gaining momentum, I started getting requests to work with earthen plasters and clay based finishes, so you could say I transitioned back to working with “mud”. Soon after, American Clay was introduced to the market, and I started getting requests to finish interiors with their products. PBL: What is unique about the way you work? CC: Probably that I work alone. Over 25 years ago I decided I wanted to become self-employed. As a consequence, I started plastering alone. The focus of my work became home interiors, since exterior cement stucco work is best left to a crew. Occasionally I’ll enlist the help of others, but primarily I continue to work alone. PBL: Why – and what – do you teach students? CC: Robert, your husband, was the first to ask me to teach; some years ago now. I discovered through that experience that I enjoyed helping others learn. As to what I teach, basically there are two parts to plastering – one, understanding the materials you are working with, how they behave, and two, the mechanics of getting the material on the wall in a controlled and efficient manner. The latter takes practice. A third component would be the aesthetic choices one makes in terms of line, form, and finish. Once someone gets the basics, everything moves forward is a refinement of those skills. PBL: What do you like most about plaster work? CC: What really turns me on about plaster is that it is a sculptural medium that transforms the space, unifying all the seemingly disparate elements. That is very satisfying and why I continue to do it. PBL: What are the signs of a masterful plaster job? CC: There are many possibilities one can achieve with plaster, from an “organic”, heavily textured appearance, to a smooth, clean contemporary look. Regardless of style, a good plaster job will have consistency throughout. PBL: What would you most like to tell readers about natural plaster? CC: First let me say, I’ve been limiting our discussion of natural plasters to earthen and clay based finishes (my experience with lime plasters and renders is rather limited to this point). That being said, for me, there is a tangible difference in the feel of earthen and clay based finishes. While beautiful visual effects can be achieved with other plasters as well, to me earthen and clay finishes have a more relaxed, soothing, comfortable feel. Second, for someone wanting to learn to work with these materials, the process is much more forgiving in contrast to plasters that have a specified set time. October 7th-9th, 2011 Charlie will be joining us at the the new EcoNest headquarters in Ashland, OR to share his expertise on applying natural plaster. There are two apprenticeship opportunities available in October for budding artisans seriously interested in learning the trade.